Along with the brain, the spinal cord is a crucial part of the body, but unfortunately, it is often injured in accidents. Spinal cord injuries can be catastrophic, permanently disabling, and tragic. In southern California. when a spinal cord injury is the result of another person’s negligence, obtain legal advice at once from an experienced Riverside spinal injury attorney – Chris Purcell. Severe spinal cord injuries sometimes require lifelong care – and the resources to pay for it. With more than twenty years of experience fighting for the rights of spinal cord injury victims, Chris understands the suffering that accompanies a spinal cord injury. If you become a spinal cord injury victim, attorney Chris Purcell can work to help you obtain the maximum available compensation. Vertebrae, soft tissue, nerve cells, and groups of nerves called tracts constitute the spinal cord. Nerve cells travel up and down the spinal cord delivering messages to the brain, and then branching out to various parts of the body. The backbone offers some degree of protection to the spinal cord, but this is usually not enough, especially in slip and fall accidents. When the nerve tracts are damaged, the consequences can be catastrophic. This usually means all communication between the brain and certain parts of the body will be cut off, resulting in total or partial paralysis. A bulging disc usually means cervical radiculopathy, pain caused by the compression of a nerve root near the cervical vertebrae. Cervical radiculopathy can be the cause of long-term chronic pain and a loss of sensation in different parts of the body. 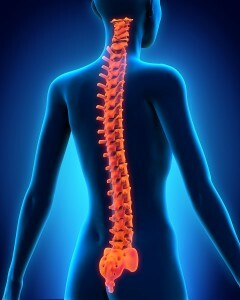 HOW DO SPINAL CORD INJURIES OCCUR ACCORDING TO PERSONAL INJURY LAWYERS IN RIVERSIDE COUNTY? Spinal cord injuries can occur in a number of different ways. The spinal cord is typically injured in slip and falls, car accidents, motorcycle accidents, pedestrian accidents, sports accidents, and violent incidents like stabbings and shootings, but any damage to the vertebrae has the potential to cause a serious spinal cord injury. When someone else is responsible for a spinal cord injury, let attorney Chris Purcell hold that person accountable, protect your rights, and fight on your behalf for compensation and for justice. Chris will evaluate the particulars of your case, explain your options, and guide your personal injury claim to its best possible resolution. Serious spinal cord injuries can often result in partial or total paralysis. Spinal cord injuries can be characterized as either complete or incomplete injuries. Complete injuries are those that result in no muscle control or sensation below the area of the spinal cord that was injured. Incomplete injuries are those that result in only partial paralysis below the injured area. Although complete injuries are permanent, victims with incomplete injuries may recover some of their functionality over time with physical therapy and rehabilitation, however this is never a guarantee. The location of the injury will usually determine the severity of physical consequences. Victims will most likely need a lifetime of additional care, meaning medical expenses will be astronomical. That is just one of the reasons why it is so important to speak with attorney Chris Purcell as soon as possible. If your spinal cord injury occurred because of someone else’s negligence, you may be entitled to compensation for your medical expenses, loss of wages, loss of consortium and pain and suffering. WHAT TYPES OF COMPENSATION CAN EXPERIENCED ATTORNEYS HELP YOU RECOVER? Current and future medical expenses: extensive hospitalization, rehabilitation and physical therapy may be required after a spinal cord injury. Medical equipment: you may need medical equipment to help you improve your mobility and function on a daily basis. Renovations: if the spinal cord injury has left you in a wheelchair, you may be entitled to compensation for the renovations made to your home and vehicle to make both wheelchair accessible. Loss of wages: many victims are unable to work after a spinal cord injury, and if this is the case for you, you may be entitled to compensation for your lost wages. Lost earning capacity: if your injury will prevent you from working in the future, you may be entitled to receive compensation for this loss of your future earning capacity. Pain and suffering: because this injury usually results in such a drastic change in the victim’s quality of life, pain and suffering may be awarded. Loss of consortium: if your spouse has suffered emotionally because of your spinal cord injury, he or she may be entitled to loss of consortium, or companionship, compensation. Even with a serious personal injury case such as those involving a spinal cord injury, compensation is never a guarantee. To find out if you may be entitled to compensation, speak to experienced attorney Chris Purcell for a free legal consultation. Compensation cannot reverse the injury you have suffered, but it can help make life easier by providing the financial resources you need to pay your medical expenses and live comfortably. Nothing is more important than your health and future. If you sustain a spinal cord injury because of another person’s negligence, contact Purcell Law as quickly as possible after first obtaining medical attention. In California, the injured victims of negligence are entitled to recover immediate and future medical expenses, lost wages, and more. Don’t wait any longer to begin seeking the justice and compensation you deserve–contact a personal injury attorney today. Chris represents clients in Riverside, San Bernardino, and throughout southern California in cases involving traumatic brain injuries, spinal cord injuries, bicycle accidents, construction accidents, motor vehicle accidents, truck accidents, dog bites, and premises liability. All personal injury claims for spinal cord injuries are handled on a contingency fee basis, so clients pay nothing unless and until Purcell Law recovers compensation on their behalf. To schedule a free consultation with Riverside spinal cord lawyer Chris Purcell, please call our law offices at 714-332-5098, or contact Chris by email today.